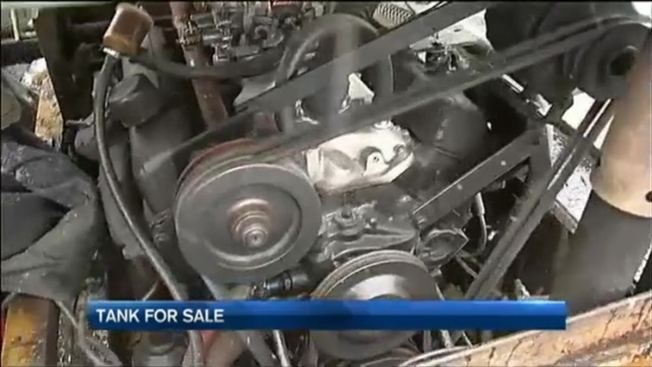 If you're in the market for a partially restored Vietnam-era armored fighting vehicle, a Maine man has an offer for you. The tank will set you back $10,000 cash – or some Star Wars memorabilia. Bob Solomon, a welder from Cornish, Maine, got the vehicle in a trade and has been working on restoring it. The tank runs well, still using its original engine. The top has been cut off, and all weapons have been removed. "It goes pretty good, it's still peppy," said Solomon. He wanted to fully restore the M114, but fell on hard times when he broke his back. To help pay for medical bills, he put an ad for the tank on Craigslist. The asking price is $10,000 – but he says you could sweeten the deal with some Star Wars memorabilia. Solomon and his children are collectors. "Part of me wants to keep it," said Solomon.